When a user sets up a new Mac, there is a helpful option to use an iCloud ID and Apple ID to login and unlock the Mac. Users can also choose at any time to have their iCloud ID as their login for OS X too. While this is undoubtedly a helpful feature and it can keep things simpler, requiring only a single password to remember, and making it easier to recover and reset a lost password on their computer, it can also have disadvantages for some situations. Additionally, some users prefer to use different passwords for different purposes for security reasons. Whatever the reason, if you opted to use an iCloud password to login to a Mac when setting up OS X, you can later choose to disassociate the iCloud login and use a separate unique local login password on that Mac again. If you have a tendency to forget login details and passwords, you probably won’t want to do this, and keeping the passwords unified may be a better choice for you. Otherwise this is a matter of personal preference. Now when the user is logging into Mac OS X, a separate account password will be used rather than the iCloud and Apple ID account password. This setting is specific to individual user accounts. Of course if you forgot your Apple ID password and login details you’ll need to handle that first, since you need the Apple ID password to disassociate the login from the Mac. Like most other things, this can be reversed if you decide to change your mind, and it’s just a matter of heading back into the preferences to reconfigure the iCloud password for logging in again to OS X. Author you say “…it can also have disadvantages for some situations…” But you don’t mention any disadvantages. Many reasons, some could be called disadvantages, up to you really. I had to do this to be able to configure the VPN server on my machine. Somehow having this enabled prevents it from working. 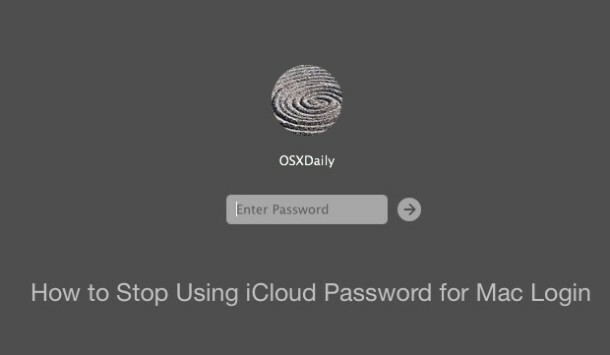 If you want to avoid connecting to Apple, either iCloud or Apple Store, whenever you use your Mac then using an iCloud login/password should be avoided. My iPd routinely pops up a login to connect to the Apple Store and I routinely reject it. Same with my Mac, which even asks “are you sure you want to skip logging into the Apple Store”. Apple may be late to the advertising party but, in my opinion, is spying and tracking any time it can. Please I bought an Iphone , unluckily it has an account . Please help me to open my phone note that my phone comes from USA but I live in Jordan in middl east. It may be that the phone you have was stolen from another person. I’m not saying that YOU stole the phone, just that somewhere along the line the phone may have been ‘liberated’ from its rightful owner. Again, your best bet is to contact Apple to clear this up. You may be having trouble loggin in because you are on mobile? Please my MacBook Pro is rejecting my valid password . How do I log in ? this doesn’t work on latest machos. Any idea how to do it? I used these exact instructions with the objective of: stop using my ICLOUD password to unlock my Mac. It always comes back with: “An error occurred while disabling Apple ID login. Please try again later” Help !